Within the oil industry, pollution common to all operations comes from hydrocarbons (Table 59). The proportion of organic dissolved pollution (oxygenated compounds, phenols, aldehydes) rises with cracking whereas the increasing refining of heavy and sulphurous crudes increases sulphide discharges. Four sectors of activity likely to produce specific effluent can be identified. Discharges include formation water extracted with crude oil and possible drilling sludge. Production water which has stayed in the tank has been in contact with oil, gas and rock. The qualitative and quantitative aspects of this water depends therefore on its origin (region, geological formation, fluid types, recovery process, operating conditions, etc.). Consequently this water is corrosive, unstable, oily as well as biologically active, toxic and its salinity may reach saturation point. In refinery terminals, ballast water from tankers and occasionally cleaning water must be treated. The concentration of hydrocarbons in ballast water may be as high as 100 mg/L. During cleaning operations, a massive quantity of detergent is used (0.1 to 3.0 g/L). Hydrocarbon emulsions are considered as stable and very concentrated and require specific treatment. Simple refineries are based mainly on the distillation of crude oil and complex refineries include a vapocracking and fluid catalytic cracking unit (FCC) which increases the quantity of wastewater as well as the pollution load in these effluents. 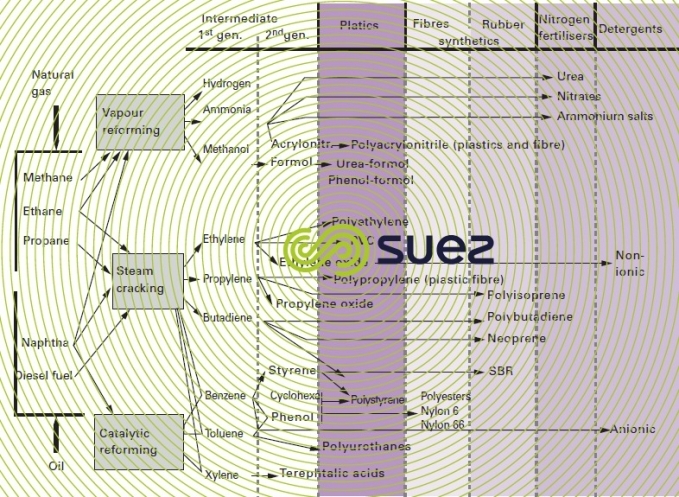 All refineries generate streams of spent soda, which, despite their low flow rates, are an important sources of pollution (soda, S2-, mercaptans, phenols). They are also characterised by the production of condensate considered as being the most polluted in the Oil & Gas Industry. Indeed, heavy and viscous products rich in sulphur are generated during FCC and are then found in the form of H2S. The quantity of water discharged, directly related to a refinery's water consumption, has significantly been lowered over the last few years. This trend is occurring thanks to local legislation, IPPC and BAT but also to less polluting refinery processes. 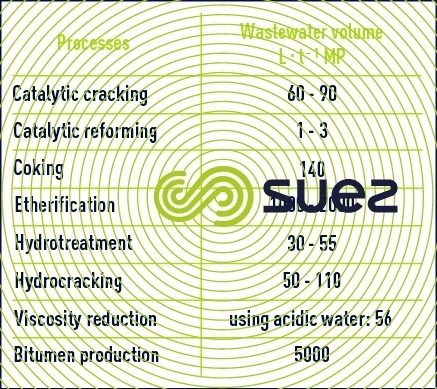 In order to ensure good quality water, new techniques have been developed such a Biofiltration, MBR(Membrane Biological Reactor), MBBR (Moving Bed Biofilm Reactor), ultrafiltration and reverse osmosis. Low or oil-free water, includes Accidentally oil contaminated water ( AOC ), stormwater, purge water from boiler and refrigerator circuits, neutralised effluent from demineralisation chains as well as domestic water. In complex refineries, wastewater is often separated and undergoes specific treatment, but if not it is mixed in simple refineries. 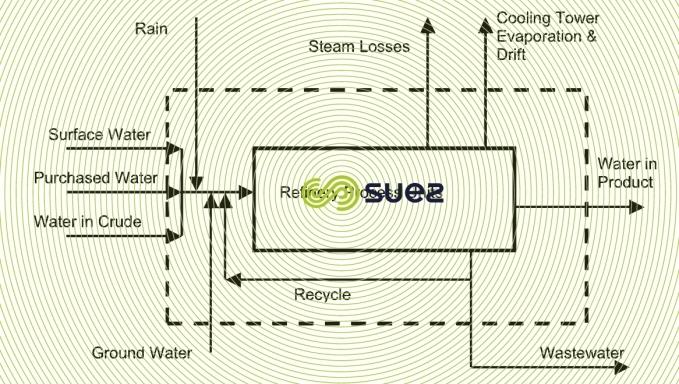 Pollution loads in process water depend directly on the process deployed. However, a desalter represents the biggest water-consuming equipment and the main wastewater-producing equipment (except for simple refineries), between 30 and 100L/t of raw material. Only 10% of the volume of refined oil products are used in the petrochemical industry. aromatic complexes, relying on catalytic reforming with synthesis of BTX and their derivatives. Polymer production is usually carried out on sites that are separate from those housing the above complexes, save in the case of polyethylene and, occasionally, polypropylene. Effluent is polluted by raw materials, solvents, catalysts and the polymers themselves in supension or emulsion form. (NH4)2SO4 in the case of caprolactame and acrylates. AℓC3 discharge is caused by alkylation reactions that take place during the refining process (petrols) and during the production of ethylbenzene and cumene (with H3PO4 acidity). 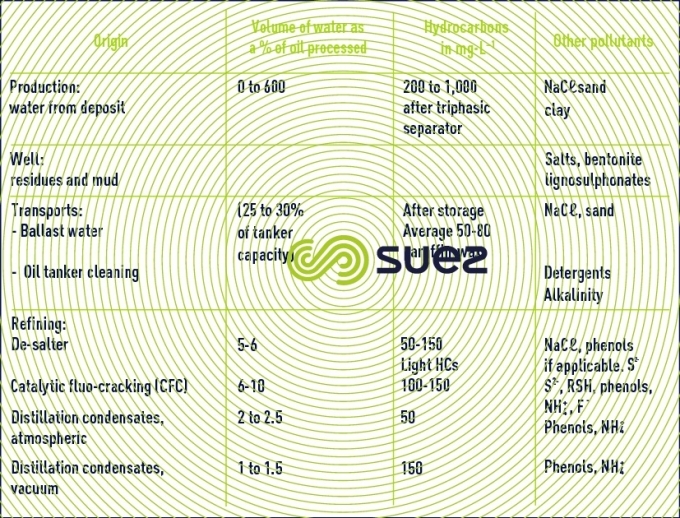 Table 63 specifies the nature of the main pollutants involved in the different productions.